Thank you so very much to Annie Hill for completing an incredible 100 day challenge and managing to raise over £650 for the Gumby Legacy to put towards our project to help children with additional needs access the benefits of surfing. Here is her motivating story about her challenge! If someone had said to me at the start of 2014, by the end of the year you’ll be the fittest you’ve ever been, and have raised over £650 for charity in the process I would have laughed in their face and dismissed them as being ridiculous. I am not a naturally sporty person and generally prefer vegetating on the sofa with chocolate to hand than going for a run. However, when my friend Bronwen set up the Gumby Legacy as a tribute to her brother, a man who loved life and the outdoors, I was truly inspired. 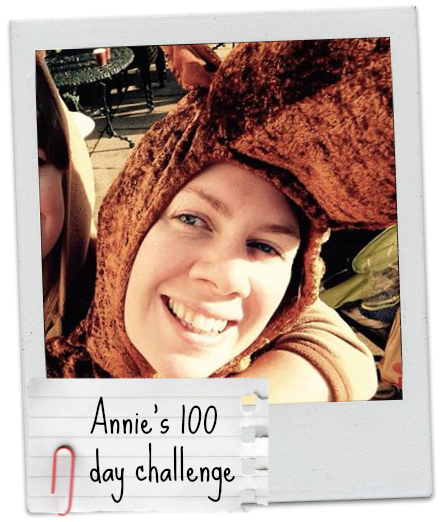 Having lost her brother in tragic circumstances Bronwen decided to keep Gumby’s memory alive and focus on something positive and constructive; so she started by setting herself a crazy challenge of doing a 100 burpees a day for a 100 days to raise money for charity. My initial thought was ‘my friend is clearly insane, that’s 10,000 burpees’!! However when she sent out a plea for others to join her in their own 100 day challenges it got me thinking. Having 3 older siblings I cannot imagine what losing a brother feels like but I figured if in the face of such adversity Bronwen could achieve this goal then for me it should be easy. So I quickly replied “I’m in”, then started to dwell on the consequence of my response. Needless to say, I put off my start date for days, then weeks, then months, with the excuse of not being able to decide what to do. I couldn’t face doing the same thing every day and I had started training 3 times a week with British Military Fitness (BMF) Swansea earlier in the year to get myself in tip-top shape for getting married, so wanted to avoid doing an activity which didn’t factor in any injuries. After much deliberation I finally decided to do a 100 of an exercise a day, every day. Everything from 100 burpees, to 100 press ups, to 100 squats, the only rule was no 2 days in a row could be the same. So I took the plunge announced my pledge to my friends on Facebook and then it slowly dawned on me there was no backing out. My many weeks of deliberation meant that I also discovered on a sunny September evening that this challenge would take me all the way up until Christmas Eve, it seemed a very, very long way away! As the days rolled into weeks, late night squats and sit ups became a part of my normal routine. To enable myself to not get too stagnant I discovered a world of random exercises from plank punches to clamps to supermans! Some were more successful than others and I even managed to squeeze in the odd burpee or few. As I got into Day 30 or so finishing still felt like it was eons away and there was many a time when I wondered just what I’d got myself in to. However, thinking about the small amount of pain and exertion I had to endure each day in comparison to the grief one experiences when losing a loved one was usually enough to pull myself together and get on with it. I won’t lie, the day I had a stomach bug and could not hold down any food involved what felt like the longest plank of my life but I got through pretty much unscathed. I also set myself the challenge of running a 10k Christmas Fun Run in a reindeer onesie for the RNLI, the first competitive race I have ever completed, then came home to complete a 100 sit ups. A hard task at the best of times but I was full of flu, luckily lemsip and some very supportive training buddies from BMF got a rapidly overheating snotty reindeer around the course! By the end of my 100 days I had completed an immense 1500 sit ups, 1000 bicep curls, 500 lateral raises, 800 tricep dips, 800 squats, 500 lunges, 500 press ups, 900 crunches, 400 plank punches, 300 burpees, 100 skips, 600 tricep extensions, 100 tricep swings, 100 supermans, 200 squat thrusts, 400 leg raises, 100 plank shoulder taps, 200 clamps, 200 tricep kickbacks, 100 jumping jacks, 100 star jumps, 100 arm circles, 1040 seconds of planking and 34km of running. Phewee! Not only did these exercises get me super fit, they also made me realise how generous people can be. The aim of my challenge was to raise money for a great cause called Surfability UK CIC. They are a local community group who provide adapted surfing experiences for children with disabilities. I used to work with many of the children and families who would benefit from the money I raised and without support and fundraising a lot of these families would not be able to access this project. As an occupational therapist, the importance of engaging in meaningful activities is close to my heart, so the idea of helping to support a project which promotes surfing to children of any ability really resonated with me. As someone who loves the sea and surfing I could really see how the sport could be beneficial both mentally and physically to the children. My hope initially was to raise £200 however I have been blown away at the support of family and friends and have raised a whopping £650, with donations still coming in! The money has helped finance blocks of surfing as well as put money towards a much needed new van. Since my 100 days have finished I have caught the fitness bug and I have voluntarily completed a further BMF 30 day challenge and signed myself up for the Spartan South Wales Super in June, AROO! I would say to anyone unsure about taking on a challenge, the feeling of achievement once completed is awesome and if you manage to raise a few quid along the way to help improve others along the way then what’s to lose, who knows you might even like it!